The PEP Long-Term Eelgrass Monitoring Program (LTEMP) includes eight eelgrass beds located throughout the estuary and representing a range of environmental factors (see map for sites and locations). The monitoring program has evolved its methodologies from its inception in 1997, however, the basic parameter of eelgrass health, shoot density, has always been the focus of the program, thus allowing for comparisons between successive years. Water quality data from Suffolk County Health Department is utilized, and beginning in 2004, water temperatures are now collected at the monitoring sites using submersible temperature loggers. Orient Point and Cedar Point sites were added in 2008. East Hampton Town Eelgrass Monitoring began in fall 2008 to determine the health of existing eelgrass in selected East Hampton waterways for the main purpose of finding high quality habitat for planting bay scallops. Initially Hands Creek, Hog Creek and Napeague Harbor were selected. Sammys Beach was added in Spring 2009 even though no eelgrass was present, macroalgae and sediment type was analyzed. The Town of Easthampton also conducted a separate eelgrass monitoring effort for Lake Montauk in the fall of 2008. 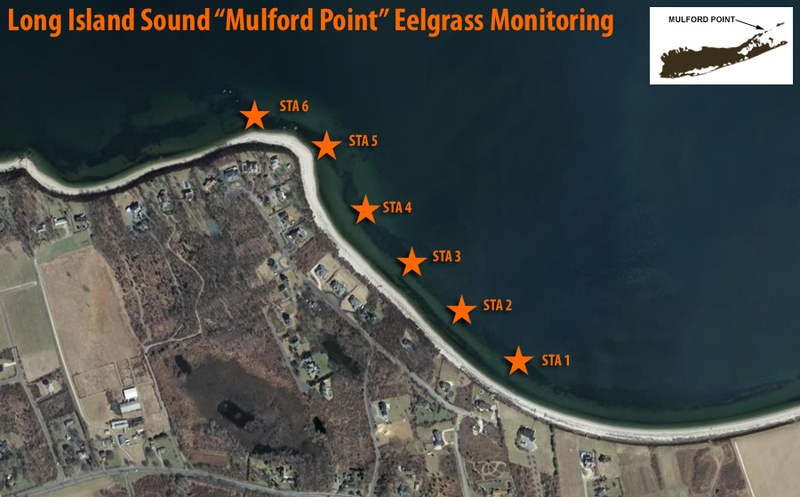 In 2004, an eelgrass monitoring site was established in Long Island Sound at the largest extant eelgrass meadow on the North Shore of Long Island. The meadow, called Mulford Point, is located approximately 2 miles south west of Orient Point in an area known as Petty’s Bight. This meadow holds special interest in that it is the largest eelgrass bed on the north shore of Long Island and it grows in a habitat that was thought to be too high energy for eelgrass to grow. The monitoring of this bed was approached in the same manner that is outlined above for the Peconic sites. Six permanent monitoring stations were established using DGPS. Divers then randomly sampled 10-0.1 m2 quadrats at each station for shoot density and macroalgal percent cover. The aerial photo below shows the extent of the bed (outlined in light and dark blue) and the location of the permanent monitoring stations at the site. A formal monitoring program has not been established for the eelgrass meadows in the South Shore Estuary, but in 2005 preliminary monitoring efforts were undertaken to characterize eight (8) meadows as part of the "Eelgrass and Bay Scallop Restoration Planning Project". The locations of these stations are marked on the map above. At each of the eight sites, ten-0.1m2 quadrats were randomly sampled for eelgrass shoot density and macroalgal cover. Additionally, counts were made of flower shoots and bay scallops, if they were encountered in the quadrats. Sediment samples were also taken at each site to identify the sediment types that support eelgrass in the bay. For more info, please click here for project details.